In the hard-hitting Danish docu-drama, Follow the Money, the Armani suited executives of Energreen play a game of cat and mouse with the Fraud Squad, pumping up the value of their wind farm ‘assets’, while erasing anything from their books that investors might reasonably conclude were liabilities. Some viewers might call it ‘creative accounting’, others good old-fashioned ‘fraud’. The apparent purpose of Energreen’s book keeping shenanigans is to lure in a steady stream of gullible investors to keep the whole circus afloat, long enough for those at the top of the Pyramid to line their pockets and set up bolt-holes in Brazil (or any other sunny place without an extradition treaty). In terms of duping creditors and investors Energreen’s on-screen exploits aren’t that far from the truth. Wind back the clock on the story of Australia’s most notorious wind power outfit, Infigen and its ‘Phoenix’ rising start and the parallels are uncanny. In 2009 Infigen magically emerged from the ashes of Babcock & Brown (which took creditors and investors for a lazy $10 billion). Despite its ashen origins Infigen hardly set the world on fire, managing to destroy $millions in shareholder value, in a matter of months. Drowning in debt, it was forced by its financiers to offload its US wind farm ‘assets’ in a fire sale last year. Hoping to pocket over $500 million from that sale, it collected a little over half that – adding further to its balance sheet’s woes. 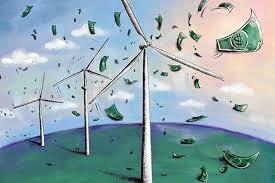 It then went on to lose another $304 million last year – blaming its dwindling revenue on, of all things, the WIND! That dismal result took its total losses to a lazy $448 million, since 2011. However, for all the delusional confidence exuded by Miles George & Co about Infigen and its wind power ‘assets’, it seems that its owners are hell-bent on getting out before yet another Ponzi scheme collapses. This entry was posted in Climate, comedy, energy, technology, weather and tagged Babcock and Brown, climate science, comedy, energy, Evergreen, Greenie Watch, Infigen, politics, ponzi scheme, weather, wind turbines. Bookmark the permalink. Meanwhile in Queensland, we have QREEP – Queensland Renewable Energy Experts Panel, wondering how the state might get 50% RE by 2030. Brilliant analysis, best thing I have read this year. Basically, the target is not going to happen. Not just a bad idea and ridiculously expensive, it is actually impossible.